Olimp Redweiler is a powerful pre-workout stack guaranteeing maximal stimulation and muscle pump. It contains the strongest active substances selected in optimal proportions, which ensure intensive effect allowing to go through the toughest trainings. L-Arginine alpha-ketoglutarate (AAKG) – highly bioavailable form of arginine, an amino acid, which increases the synthesis of nitric oxide in the organism. It exhibits the ability to increase the lumen of blood vessels, which is related to increasing the volume of cardiovascular bed and intensified transport of blood. Along with it, peripheral tissues are provided with more nutritious substances, which enables their more intensive work. During physical effort, skeletal muscles mainly benefit from this. Having at their disposal more energy substrates, they are able to work more intensively and longer. This phenomenon is felt as the so-called “muscle pump”. Being based on the same mechanism of increasing venous-arterial flow, arginine also helps to achieve and maintain erection. Citrulline malate – works synergistically with arginine, increasing its ability to cause the phenomenon of muscle pump. Apart from increasing training possibilities in response to increased supply of energetic substances, it is also conducive to regeneration. Increased transport of nutrients enables more effective regeneration processes. Acidic radical of citrulline malate is also not without a meaning. Ionized form of malic acid is one of the intermediate products in Krebs cycle, which is a basic aerobic process in the system of energy extraction. Providing malate facilitates this process, which is related to more effective work in aerobic scope. Trisodium citrate – a substance commonly used as an additive to food as preservative, used in the preparation due to its properties buffering pH. During physical effort, the synthesis of lactic acid is intensified and consequently, the environment around skeletal muscles is acidified. It causes pain and limits effort abilities. Providing the substances with alkalizing properties, such as trisodium citrate allows to neutralize the secretion of lactate and maintain neutral environment in muscle tissue for a longer period of time, which increases its efficiency. Vitamin B6 – takes part in the processes conditioning energy extraction from the provided nutritious substances, in relation to which, it is a key element, essential for the proper functioning of energy balance in the organism. It also exhibits the influence on the cardiovascular system, increasing its efficiency by regulating the rhythm and strength of heart contraction. Vitamin B6 is also essential for the proper functioning of the nervous system. Beta-alanine – is a carnosine precursor, which works like an intracellular acid-base buffer. Similarly to trisodium citrate, it decreases acidification of working muscles, increasing the efficiency of their work. By neutralizing pH in muscle tissue, it also enables faster and more efficient regeneration processes. Beta-alanine is responsible for the feeling of skin tingling among some people after the application of the preparation. Creatine – in the preparation is available in two forms characterized by high bioavailability and stability in the digestive system. It is the most common and the best-researched supplement increasing effort abilities. It directly provides a substrate for the phosphagen pathway of energy extraction, especially important in sports requiring large supplies of work in a short period of time, such as sprints or strength trainings. By facilitating the production of ATP, it enables more efficient work of skeletal muscles, which is related not only to the direct promotion of the achieved effects, but also generation of larger training stimuli, which facilitates the way to achieve determined goals. Combining it with the ability of creatine to modulate the activity of myostatins and increasing the volume of sarcoplasm, enabling better nourishment of muscle tissue, creatine becomes not only a supplement improving physical abilities, but also a powerful anabolic product. Importantly, numerous scientific studies confirm the safety of use of creatine, even for a longer period of time. Calcium phosphate – highly bioavailable form of a basic building macronutrient of the human organism. Due to the character of this supplement, the role of calcium in muscle contraction is especially important. In cell membranes of movement neuron axons, calcium channels are present, which are activated under the influence of nerve impulse, thanks to which their concentration inside cells rises. It causes the secretion of acetylcholine, which after reaching a muscle cell causes the secretion of calcium ions, this time from endoplasmic reticulum of myocytes. Their combination with troponin initiates the contraction of skeletal muscle. Therefore, calcium is essential in order to maintain the activity of muscle fibers and the proper activity of motor entities (complexes of muscle fiber with neurons that innervate them). Its supplementation is conducive to increasing the amount of muscle fibers activated during the contraction, which allows to generate more strength. Niacin – also known as vitamin B3, takes part in the metabolism of nutrients, thanks to which it stimulates energy metabolism in the organism. It also exhibits the ability to regulate the level of sugar in blood, facilitating nourishment of working skeletal muscles. Moreover, niacin is able to influence emotional state, improving it. Vitamin B1 – also called thiamin. It conditions proper metabolism of nutritious substances, thanks to which it allows to effectively derive energy from food. It is the component of carboxylase, enabling oxygen decarboxylase of carboxyl alpha-keto acids. It also a promotor of acetylcholine’s activity, a neurotransmitter responsible for the stimulation of muscle fiber in response to nerve impulses, therefore it is essential for proper neuromotor control. L-tyrosine – is a precursor of dopamine, thanks to which it positively influence emotional state of a human being, increasing motivation and improving well-being. It is also present on the pathway of the synthesis of adrenaline and noradrenaline, the hormones mobilizing the organism and stimulating physical ability. It improves both effort and mental abilities, facilitating concentration and memorizing. Moreover, it stimulates the synthesis of thyroid hormones, thanks to which it positively influences metabolism, increasing its pace. Caffeine – the most popular stimulant, both common and effective. Thanks to two mechanisms of operation, it is incredibly effective when it comes to stimulation and decreasing the feeling of fatigue. Firstly, as an antagonist of adenosine receptors, it binds with them, but does not activate them. In this way, it blocks the ability of binding the factor signaling the organism’s fatigue, adenosine, with its receptors. It allows to decrease the feeling of fatigue and the related drop in efficiency. Secondly, caffeine is a competitive inhibitor of cAMP-phosphodiesterase, which is responsible for transforming cyclic adenosine monophosphate to its inactive, noncyclic form. cAMP accelerates metabolism on cellular level, enabling more effective work of whole tissues and intensifies the effectiveness of stimulating adrenaline. Apart from this, one of caffeine metabolites, paraxanthine, stimulates lipolysis, which increases the availability of fatty tissue, as a source on energy, facilitating its reduction. Capsaicin – in the supplement it comes from the extract of Cayenne pepper. It positively influences cardiovascular system, increasing its efficiency. It increases body temperature, is a thermogenic, thanks to which it facilitates burning fat. It also demonstrates the ability to reduce muscle pain, which enables their more intensive utilization during training. Piperine – its main source in the supplement is the extract from black pepper fruit. It exhibits the ability to increase the absorption of active substances, along with which it is administered. It is also an inhibitor of lipogenesis, thanks to which it limits the storage of fatty tissue. It also positively influences metabolism of nutrients. 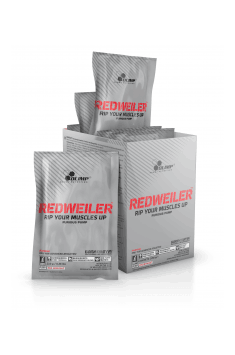 To sum up, Olimp Redweiler is an advanced pre-workout supplement composed in such a way as to stimulate training abilities at each possible level. It strongly stimulates, but also maximizes physiological processes conducive to achieving the heights of physical abilities and provides elements, which enable more effective work of skeletal muscles. Aromas, sodium citrate, calcium phosphate, creatine malate, anti-caking agent (silicon dioxide), acidity regulators (citric acid, malic acid, caffeine, sweeteners (acesulfame K, sucralose, cyclamates), thickeners (gum arabic, xanthan gum, salt sodium carboxymethylcellulose, colors: cochineal (red punch flavor), beta carotene, cochineal, riboflavin (oragne juice), riboflavin (citron power and lime crime mint flavors), brilliant blue FCF (taste and blueberry madness and refreshing berry), riboflavin, brilliant blue FCF (green apple blast), E150d (raging cola flavor).